The best training tool to begin the house training process is a crate. Get your dog a small wire mesh crate that is the perfect size for your little pet. Make sure that the crate is big enough to accommodate increases in size over the next few weeks, and small enough that he doesn’t find a small corner of the crate to relieve himself in. Initially, keep your dog in the crate for short periods of time, taking him out to the yard at regular intervals to get him to eliminate. If he does, lavish him with praise and giver him a reward. if he doesn’t, take him back to the crate. Continue with this till you can see a pattern emerging. Over a period of days, your dog’s toilet schedule will become clear. 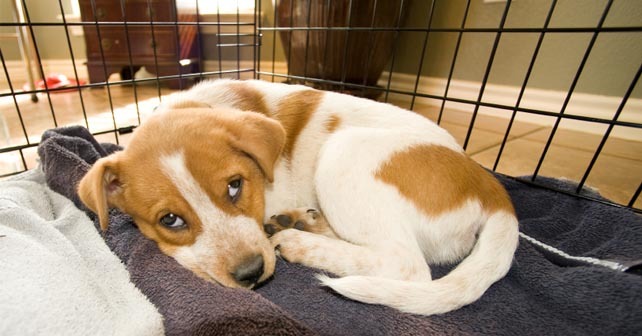 Being confined to the crate will help your dog learn to retain his urine and feces for longer periods of time. Don’t keep him confined for too long, however. If he relieves himself in the crate, it might set your training back by a few weeks. This is the part where you will need to invest time in – removing him from his crate at regular intervals, and taking him to the yard. Always remember to reward any elimination. Good dog training involves not punishing any accident, however. All dogs have accidents along the way, and swatting his head with a newspaper or rubbing his nose in his own mess only makes your dog frightened to eliminate in your presence, which brings you back to square one, as far as potty training is concerned. When there is an accident, clean it up, and make a note of the time. Have a toilet schedule in which you can write down the times in the days during which your dog urinated or defecated, so you’ll have a better idea of what to expect. Expect house training to continue over a period of time. This can be one of the hardest things to teach a dog, and a little patience and perseverance will go a long way. Continue house training even at night. Your puppy has a smaller bladder and bowels, and will need to eliminate more often than an adult dog. Make a midnight potty run with your dog to establish elimination habits at night. When there are accidents, show your disapproval immediately. Dogs don’t have long term memory when it comes to their daily routine. When they eliminate inside the house, they forget what they have done almost immediately. So, if you find a mess in the house, and go looking for him to reproach him 10 minutes after he’s actually done the deed, all angry at him and flustered, he has no idea what you’re mad about because he just does not remember. Your dog doesn’t have accidents to annoy you – on the contrary, dogs exist to make their owners happy. As an owner, its your responsibility to train your dog to behave the way you want him to. He’ll be more than happy to oblige, if you just teach him right. Another disadvantage of showing disapproval late is you risk establishing whatever behaviour he was engaged in at that exact moment as undesirable. If he was drinking water from his bowl, and you barge in angry at his accident, he connects your disapproval to his drinking water. So, now he’s completely clueless about what you want! When your dog is out of the crate, watch out for tell tale signs of potty time. A dog who needs to urinate will walk round and round in circles, sniffing. When he exhibits this kind of behaviour, stop whatever you’re doing and take him outside.